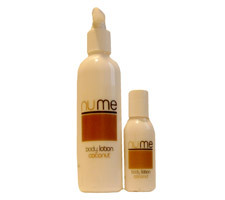 Light and creamy coconut lotions will rapidly hydrate, condition and prevent moisture loss. Helping to protect the skin from environmental elements and maintaining the skins own suppleness and radiance. The perfect finish to a Sugar Rub express body treatment, the light texture ensures that the client leaves feeling fresh, enlivened and ready for the rest of their day or evening. This product is best for normal to lightly dry skins that require a light moisturiser which absorbs quickly leaving not residue. Warm the appropriate amount of product in your hands. Effleurage gently over the body until absorbed.